Joel Meyer-England is making quite a name for himself with his paintwork. He's known for his classic Mexican-blanket-style gas tanks that are flawless every time. I'm sure if you follow ChopCult on social media you've seen us share his creations from time to time. I love Joel's infectious enthusiasm and good nature. He stands out by being one of the good guys and lets his work do the talking. I thought it would be only fitting to do a quick Q and A and let you get to know the man behind the spray gun. Enjoy! 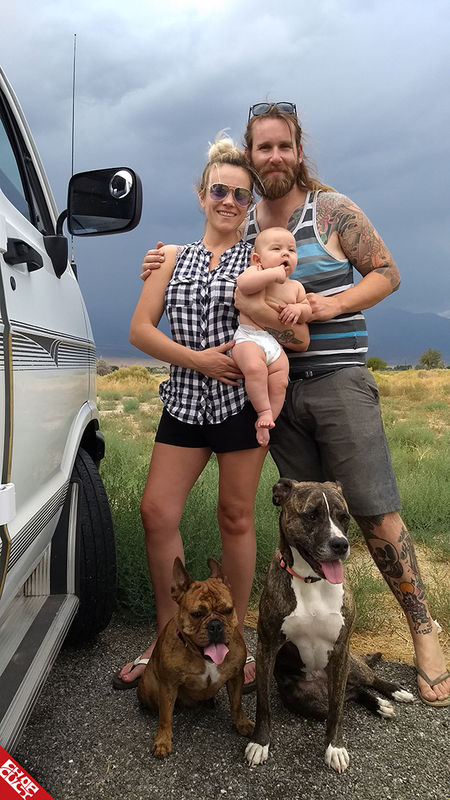 I am a painter living in the Joshua Tree area of California with my partner Cara, 5-month-old baby girl Zayla, and our two dogs. Grew up in Wisconsin and I have been into motorcycles my whole life, but fell into painting about four years ago where I left the film industry after having gone to film school and five years working 80-hour-weeks on TV shows and feature films. While working on the TV show Criminal Minds, I met one of my best friends, Fleabag, who is an old-time chopper guy and he turned me onto building choppers. When did art come into your life? I was interested in filmmaking and photography since I was a little kid, but that was the extent of my art interest for most of my life. As for painting tanks, I didn't even look at it as art until maybe two years into doing it. When was the first time you held a paint gun? 4 years ago, it was a Harbor Freight cheapy gun that I painted more tanks than I probably should have with. Which do you consider easier to paint? Helmets or gas tanks? I strongly dislike painting helmets, I only do it begrudgingly from time to time. I find it much easier to paint a gas tank. Do you prefer to have the customer in control or do you work better when you are given artistic freedom? I like to have some input from my customers, but more general stuff. I like to be able to let my creativity flow at the moment. What is your go-to brand of paint and why? Most of my work is sparkly, and my go to for that is Painthuffer Metalflake. As for candy, I use House Of Kolor. I notice that Painthuffer MetalFlake sponsors many painters. How does it feel to be included with such talented artists? It has been an honor to be one of the artists sponsored by Painthuffer. They have the best flake out there hands down, I used it long before becoming sponsored and would use it even if I wasn't. The owner Brian is a super nice guy, and I have enjoyed our working and personal relationship. They have some amazing artists they sponsor, and I feel very special to be on their team. 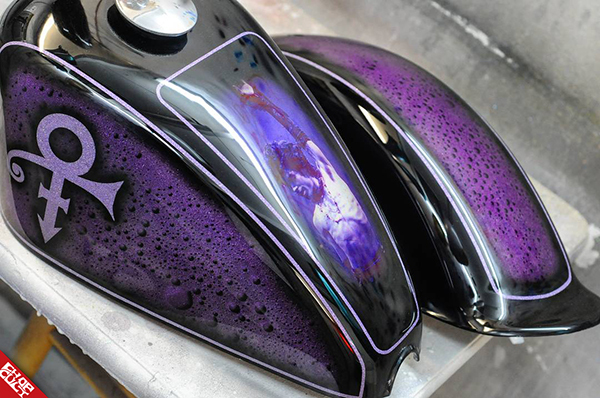 I'm sure you have painted MANY gas tanks over the years but what are some of your personal favorites and why? My favorites tend to be one I paint for people that are special to me like this one I did for one my best friends and talented tattoo artist Mike Daigneault, it's different from the typical flaked tank I do, and he let me do whatever I wanted to do. Another one I really love is the fun UFO tank I did. Brittany, who I did the tank for, has a little dog and I worked hard to try and make the dog being abducted look like her dog. Lastly is this tank I did for a customer awhile back that I just always really loved. He ended up selling his bike to a friend of mine that traded me the tank for a different one I had painted so now I have this tank in my collection! Who inspires you in the industry and why? I am really inspired by Deny Babin. I think he is putting out the coolest designs, and his skills at aged paint are out of this world. On top of being such a killer artist, he also is a super nice, genuine guy. What type of music do you listen to while working? One of the best things about living in the desert is I can listen to music super loud as I work. 9 times of out 10 when I'm working it's going to be Michael Jackson, he was the best and inspires me to be the best I can be in both my work and personal life. Peanut butter and jelly or grilled cheese? I'm from Wisconsin, so I have to go with cheese! Do you have anything in the works that you'd like to share with our readers? Look for another raffle tank from me at this year's Babes Ride Out, pretty stoked to be doing my third tank for that rad event. I am also working with Biltwell to paint a helmet for their Helmet Show at the David Mann Chopperfest. I will be showcasing my paintwork in the David Mann and Friends Art Show as well. First and foremost I want to thank my wonderful partner in life Cara, she supports everything I do and pushes me to be the best me that I can be. I would also like to thank Brain at Painthuffer for all this support and his friendship. Also, I want to thank some of my friends, Mike D, Fleabag, and Radar for letting me get crazy with your bikes and for being so rad people. Finally, I would like to thank ChopCult for supporting me, it has been such a blessing. How can our readers find out more about your work? The best way to see my work and to reach out to me is via Instagram. I also have a website, but Instagram is the best way for sure. Love your work Joel! Michael Jackson huh? LOL! I can dig it. Absolutely fantastic work. Thanks for sharing and keep on keeping on. Hey loud pipes, you cant see any better than you can hear. That's Prince. Nice work Joel, stop back and see us in Wisconsin. Love to UFO and Mexican blanket tank! Love these old style paint jobs. Mexican blanket is amazing. Great work!